The conclusion we draw from our extended discussion of the interesting descriptive problem Hetzron provides is that Somali offers no support to the view his paper defended: that syntax and phonology are partially intermingled domains. Merely letting the agreement rules of Somali have access to phonological properties of morphemes would not, in any case, suffice for the statement Hetzron would like to make; as we have seen, no phonological properties of the relevant strings can be used to predict the occurrence of ‘playful agreement’; Hetzron does not even sketch a grammar-fragment that would achieve such prediction, and apparently this could not be done. An adequate account needs morphological features, and this does not need to make reference to phonology. Hetzron's point about the ‘playful’ character of the agreement possibilities with sub-plurals should really have been presented as a hypothesis about the historical development of Somali — a study of psychophonetic factors in syntactic change. It is crucial, however, to see that this is not the same as a hypothesis about the grammar of Somali. Speakers may be influenced by the sound of the sentences in their language when they go along with a tendency that leads to a change in the grammar; but that does not mean that syntactic rules in the grammar of a language can have phonological conditions. 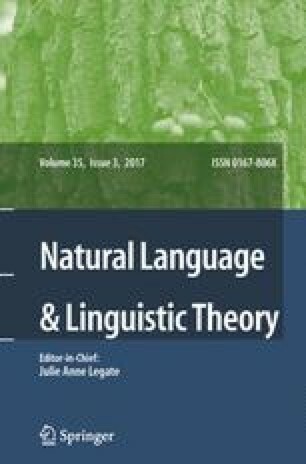 We claim, in fact, that in no language does any syntactic rule show sensitivity to phonological properties. This work was completed while Zwicky was at the Center for Advanced Study in the Behavioral Sciences; he is grateful for financial support from the Spencer Foundation and for sabbatical leave from the Ohio State University. 1.Dept. of LinguisticsOhio State UniversityColumbusU.S.A. 2.Dept. of Linguistics Cowell CollegeUniversity of CaliforniaSanta CruzU.S.A.